Open shelving– A dedicated baker will always utilise open shelving where possible, creating that real ‘lived in’ feeling. You’ll need easy access to those ingredients you use regularly and trawling through cupboards just won’t do once you’re in the middle of it all. Think about having your cookbooks easily to hand. If you like the idea of shelving but your tall walls are slightly intimidating, you can easily add a built in stepper stool into your lower cupboards for ease. Appliances – A warming/cooling drawer is just what you need if you love to entertain or having guests stay regularly. Your best baked bread results will come from a dough that is well proved, whether you proffer it hot or cold. Once you’ve baked your delicious delights, a cooling drawer will come in very handy – or perhaps to keep those ingredients that don’t keep as well as you’d hope. When you’re entertaining, store wine bottles for guests to help themselves to whilst you’re in the midst of food prep. A double oven will always be welcomed for those busy days when shelf juggling won’t do the trick. Storage – Incorporating specialised drawers for easy access and storage for baking trays, pots and pans will be the biggest gift you can give yourself. No one likes having to get on their knees to reach all the way back into a gloomy cupboard and rearranging every pot and pan in sight. Bulk storage drawers are a great alternative, helping you search and store utensils easily. Rotating cupboard shelves are also very convenient. If you don’t have a pantry, drawers will work just as well for your ingredients. Spice drawers are becoming ever more popular as well as stainless steel airtight ingredient bins for a professional finish. Technology area – This is certainly one for those of you who love to follow cooking shows and online tutorials. Create a space you can set up a tablet or incorporate a small television. USB ports will do nicely here, particularly if your kitchen is your most well used space in the house. 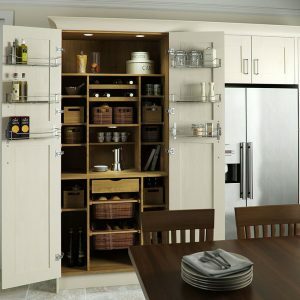 Added furniture – It’s good to think about the additional furniture you might want to add to your kitchen and not totally occupying it with built in pieces. A traditional baker’s kitchen will have a good mix of both new and old. A pastry table for example, is traditionally lower than your other surfaces, using a cool, solid stone. Roller shelving adds a nice touch, for adding a handy space that can be moved around the kitchen. This entry was posted in General DIY Tips, How To Guides, Painting & Decorating, Products and tagged kitchen designers Conwy by homeadmin. Bookmark the permalink.